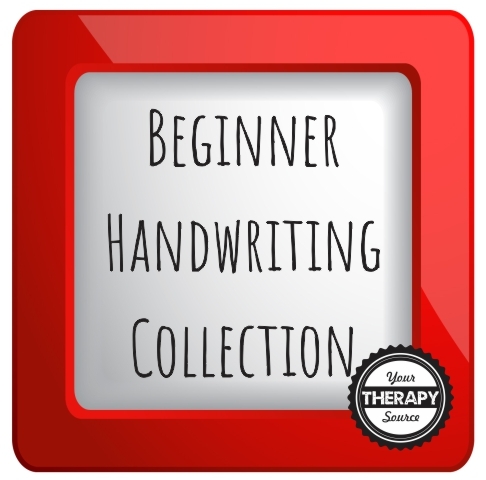 This Beginner Handwriting Collection includes everything you need to get started with handwriting instruction and practice! If you were to purchase each title individually the total cost would be $67.88. When you buy the entire collection at once, it is 50% off and only $33.00! Get all of these titles for only $33.00! Lines, Lines and More Lines ($3.99) – This download is a collection of pre-writing visual motor worksheets. Practice pencil control for vertical, horizontal, diagonal and curved lines. There are 4 separate activities included: 24 task cards to practice pre-writing strokes, 5 worksheets connecting words starting with the same letter drawing different lines, 4 spin and trace the line games and 3 roll and finish the picture games. 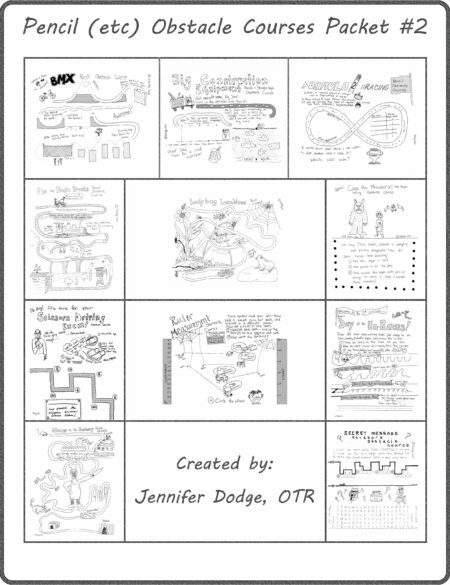 Prewriting Activity Pages ($4.99) – includes 50 black and white pictures to trace and color. This is a “just right” activity for children who are learning to write, draw and color. Each picture has dotted lines for the child to trace to practice visual motor skills. Once completed, the child can paint or color the picture. Various prewriting practice strokes are included throughout the packet such as vertical lines, horizontal lines, diagonal lines, curves, circles, squares, loops, wavy lines and more! Letter Races ($4.99) – Letter Races includes 38 fun games to print, cut and play. Practice writing letters in this one person game where you draw letters out of a hat, write the letter and see which letter wins! Add in sensory motor skills by having the child bear walk, run or jump to get the letters before writing. There is one for every letter of the alphabet for upper and lower case. In addition, there are 11 letter races for common letter reversals. NEW: one blank template to write in any letters you need to practice! Fading Lines and Shapes ($3.99) Download includes worksheets that gradually increase in visual motor difficulty while decreasing visual input for line and shape formation. There are 18 worksheets for line formations ie horizontal, vertical, curves, waves, diagonals, spikes and combinations. There are 9 worksheets for shape formations ie circle, cross, square, rectangle, X, triangle, diamond, oval and heart. 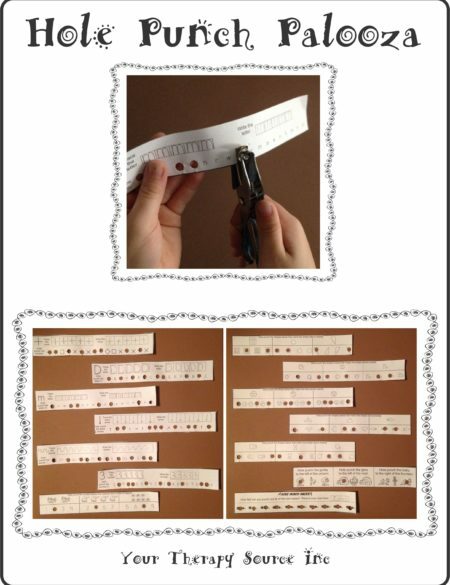 Fading Alphabet Dotted Line Style ($4.50) Fading Alphabet includes worksheets that gradually increase in visual motor difficulty while decreasing visual input for letter formation. There are 26 double lined worksheets for boxed capital letters and 26 double lined lowercase letters (Handwriting with Tears style) AND Fading Alphabet – 26 Uppercase Letters and 26 Lowercase Letters Dotted Lined worksheets (Zaner-Bloser style). Handwriting Stations ($6.99) – includes the materials to create a handwriting station on a tri-fold or in a folder. The station includes proper letter formation for capital and lower case letters, correct posture, pencil grip, warm up exercises, letter reversals tips and self check sheet. In addition, there are 27 worksheets for the alphabet and number practice (Handwriting without Tears® style and Zaner-Bloser® style). Animal Action Alphabet ($4.99) – Animal Action Alphabet is a great way to get some upper extremity input before handwriting practice. 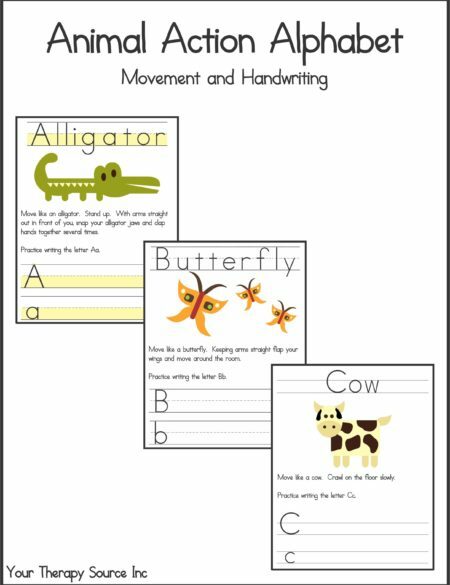 This download includes 26 animal actions (letters A-Z) with three different handwriting practice options: highlighted dotted lines, dotted lines and double lines. Children will be moving while learning with these worksheets. 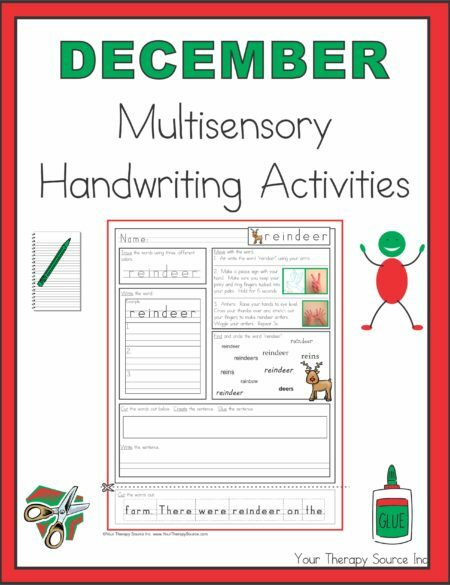 Visual Perceptual and Handwriting Practice Pages ($4.99) – Digital download of activities to practice letter formation, visual motor, visual discrimination and visual spatial skills. Each letter page includes double line (Handwriting without Tears® style) and dotted line (Zaner-Bloser® style) format plus a visual perceptual activity related to the letter. Handwriting Templates with Alphabet Guides ($4.99) – download includes various templates to encourage proper handwriting. The three types of font/layout includes: 1. Dotted line Zaner-Bloser® type font, 2. Double line Handwriting Without Tears® type font and 3. New South Wales (NSW) Foundation Manuscript. The templates include alphabet with arrow cues for letter formation, regular alphabets, go and stop lines on left and right side of paper, 3 different sized lines (large, medium and small), draw and write with alphabet, spelling lists with alphabet, highlighted papers and numbers with three different sizes of graph paper. Doodle Diaries ($3.99) – Doodle Diaries includes 15 squiggle drawings and 25 doodles drawings to finish then write a story about your drawing. This download has two formats for the writing area – dotted lines or double lines. Use these drawing starters to encourage drawing and writing. Handwriting Rubrics ($7.99) – This is an electronic book of 26 rubrics to assess handwriting. A rubric is a scoring guide to judge performance on a specific task. Have you ever wanted to quantify handwriting skills such as letter formation, speed or copying? Handwriting Rubrics can be used as assessment tools to quantify an individual’s written productivity. By using the rubric, each individual can be scored based on the same criteria. If you only need HWT style font check out this HUGE megabundle!